WASHINGTON — The U.S. agency responsible for handling the surge of migrants arriving by caravan at the California-Mexico border has no plans to increase its capacity to process and temporarily house the roughly 150 Central Americans waiting in Tijuana, three U.S. officials told NBC News. During migrant surges in the past, the Obama administration erected temporary holding facilities, known as tent cities, and sent more officers to the border to process asylum claims. 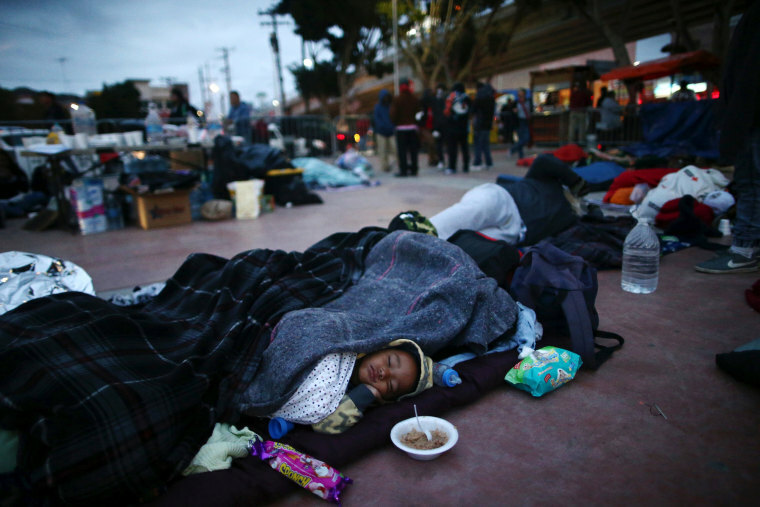 But now, as more than a hundred Central American men, women and children sleep on concrete on the Mexican side of the border, U.S. Customs and Border Protection (CBP) has no plans to increase its capacity to speed the flow of migrants into the United States. On Sunday, CBP issued a statement that it had reached capacity at the San Ysidro port of entry, the processing center where migrants enter the United States from Tijuana. "At this time, we have reached capacity at the San Ysidro port of entry for CBP officers to be able to bring additional persons traveling without appropriate entry documentation into the port of entry for processing," CBP Commissioner Kevin McAleenan said in a statement. "Depending upon port circumstances at the time of arrival, those individuals may need to wait in Mexico as CBP officers work to process those within our facilities." U.S. Citizenship and Immigration Services, the agency responsible for handling asylum claims, has sent some additional officers to San Ysidro, but immigration advocates working on the ground say their impact is negligible since migrants are unable to cross the border to make their claim. Forcing migrants to wait is part of an overall strategy by the Trump administration, said a Republican congressional aide. "They want them to wait and they want the American public to see how many people are trying to exploit the loophole in the asylum system. It's a different strategy from years past," the aide said. In order to claim asylum, migrants must show that they have a credible fear of being persecuted in their home country for their race, religion, nationality, membership in a particular social group or political opinion. In the spring of 2014 and fall of 2016, both periods of high border crossings, the Obama administration surged resources to the border to avoid a bottleneck like the one seen now. In the Rio Grande Valley, CBP built temporary tents to house migrants who were being processed. When Trump came into office in early 2017, tent cities like the one in Donna, Texas, were taken down because the number of border crossers had diminished. León Rodríguez, a former director of Citizenship and Immigration Services, said the Obama administration anticipated upticks in immigration and planned accordingly to reduce wait times for filing asylum claims. "If there was an expectation that people would be coming, we would surge asylum officers to the border," Rodriguez said. "There was a process for processing them and housing them."